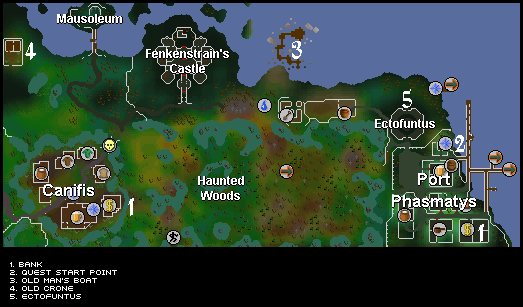 If you are looking for the modern RuneScape guide for this content, please see our Ghosts Ahoy guide. The citizens of Port Phasmatys have unwittingly consigned themselves to an immortal existence, trapped forever in this world as ghosts. 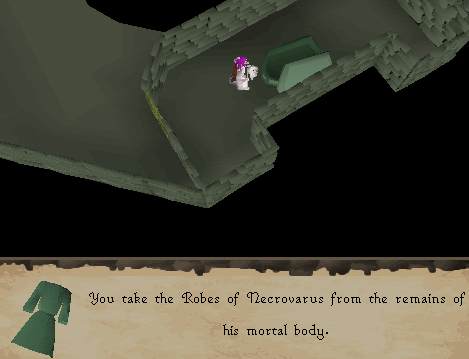 Necrovarus, lord of the Temple of Phasmatys, holds the key to the door into the next world. Can you convince him to open it and set them free? Begin by speaking to Velorina in Port Phasmatys. First off, head to Port Phasmatys located to the east of Canifis. You'll need to journey through the Dark Woods, which is crawling with Vampires and Leeches. You can alternately head east past fenkenstrain's Castle (from the Creature of Fenkenstrain quest), past the Undead Farm and then south into a temple. While wearing your Amulet of Ghostspeak, talk to the Ghost Guard near the Energy Barrier who tells you that you need 2 Ectotokens to enter. 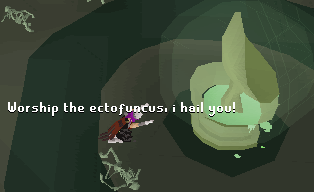 Speak to the Ghost Disciple and ask him about Ectofuntus. Climb down the trapdoor to the west and continue down each of the levels until you find a pool of green slime. Fill your buckets with it and head back up to the temple. Now climb the ladder to the east and grind up several sets of bones. To do this, grind them in the machine, wind it up, and then empty each one into a pot. Now climb back down and use the slime with the Ectofuntus in the center of the temple. Now talk to the Ghost Disciple again and he will give you 5 Ectotokens, which can be used to enter the port. You'll need about 43 tokens to complete this quest. Now go inside of the city and head east. Talk to Velorina and ask her what's the matter. Ask about what happened, and then tell her that you'll help the ghosts. After that, head back to the temple and speak with Necrovarus who refuses to let her go back. Speak with Velorina again and she will ask you to find an old Crone. 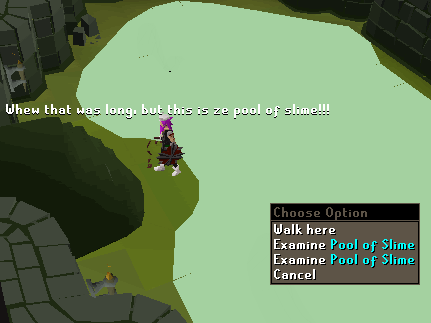 The old Crone can be found to the east of the Canifis Slayer Tower and west of fenkenstrain's Castle. She will ask for some Nettle Tea. Just pick some Nettles found near Mazchna the Slayer Master with some gloves on, and add them to a bowl of water. Cook it over a stove or fire. Now she wants to drink some in her special cup, so use the tea with the Porcelain Cup. After trying to give it to her again, put some milk in it. Afterwards, she will ask for 3 items in order to enchant your Amulet of Ghostspeak: a Book of Haricanto, Robes of Necrovarus, and something to translate the book. Now ask if there's anything you can do for her. She asks for you to bring a model ship to her son. She will give you a Model Ship, which can be repaired with Silk, a Thread, a Needle and a Knife. Before heading out, remember, you MUST bring your dye with you. Now head east passed Fenkenstrain's Castle toward the Undead Farm. Go north to find a boat to the north. You can just walk in from there. 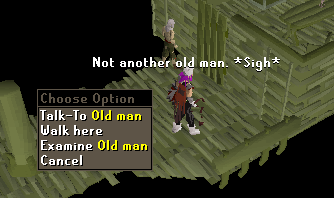 When on the boat go up the ladder to find the old man. Search the Mast when the wind speed is Low, and it will show you the colors for the boat. You must dye the correct part of the sail according to what the color of the flag is. It would be best to bring 3 of each kind of dye (red, blue and yellow) with you, and after coloring each of the 3 parts bring it to the Old Man. He will give you a Chest Key, which is used to lock the chest in the Pirate Captain's Room for a Map Scrap. Now cross the gangplank in the northwest corner, jump the rocks, and at the end is another chest with another Map Scrap inside. Now head back to the boat, and climb down the ladder. 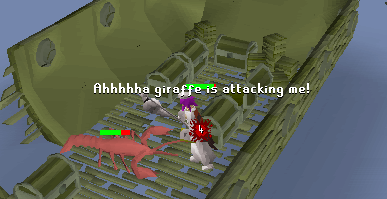 Search the chests until a level 32 Giant Lobster attacks you. After killing it, search the chest again for another Map Scrap . 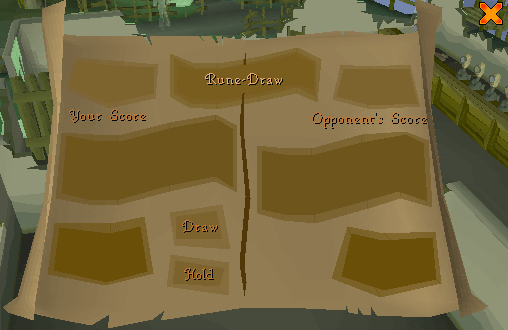 Put the pieces together to get a Treasure Map for Dragontooth Island. Now head back to the port and talk to the Ghost Captain located southeast of Velorina, who will take you there for 25 Ectotokens (or 10 Ectotokens if you "charm" the captain with a Ring Of Charos (a)). To find the treasure, begin by standing next to the statue on the side that his arm is pointing. Walk the number of spaces that the map tells you to. Most likely, it will be 6 South, 8 East, 2 North, 4 East, 22 South, which is shown on the below map. After digging with your Spade, you should find a Book of Haricanto. Head back to the port and get some bedsheets from the Ghost Inkeeper at the pub. Go to the temple, dip it in slime and speak to Gravingas while wearing it. He can be found near the market stalls by the entrance to the city. Tell him that you'll be happy to help, and he gives you a Petition. Start speaking to villagers and ask them to sign it. Some will sign it quickly, others will ask for ectotokens, and others will not sign at all. Once you find two of them, you can just alternate between them to get signatures. Note: You must be wearing your Ghost costume or the villagers will not sign your petition. While wearing the bedsheet, you cannot run. After you have 10 signatures, bring the petition to Gravingas, and he will ask you to bring it to Necrovarus. Bring it to him, and he will burn it and drop a Bone Key. Go upstairs of the temple, unlock the door and search the coffin to find some Mystical Robes. Go speak with Ak-Haranu, the Samurai at the docks of Port Phasmatys. He wants an Oak Longbow signed by Robin Hood in exchange for a Translation Manual. 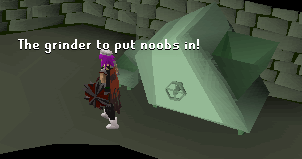 Robin is at the Inn, and he wants to play RuneDraw. The object of the game is to get the most points (and not to draw a Death Rune from the bag!). Each Rune is assigned a value: Air=1, Mind=2, Water=3, Earth=4, Fire=5, Body=6, Cosmic=7, Chaos=8, Nature=9, Death=lose. Each game costs 25gp, and you just need to win 4 games (it's very easy). He will eventually sign your bow, so bring it back to Ak-Haranu to get a Translation Manual. Bring the 3 items to the Crone, who will now enchant your amulet. 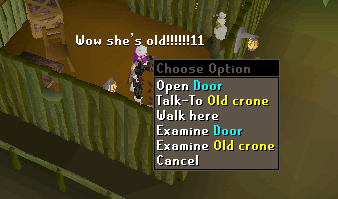 Go back to the temple, speak with Necrovarus and ask him to let the souls pass (or you will have to recharge the amulet at the Crone). Once you have told him, go back to Velorina and... Quest Complete!